The Court’s announcementsuggests attorneys visit PACER to view information that used to appear in the disposition sheet. However, viewing the latest CAFC developments on PACER is neither easy nor free. The Court also offers updates on their website that you can check daily— which adds yet another task to your “to do” list. A third option is to subscribe to the CAFC’s RSS feed, but that requires downloading and configuring an RSS reader and it can be difficult to share updates with others. These options are less than ideal, and fail to fill the void created by the discontinued disposition sheets. 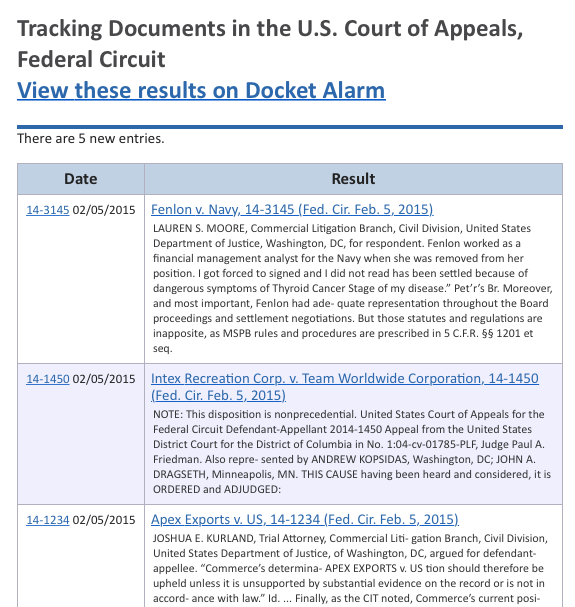 The best option for attorneys looking to receive daily updates from the Federal Circuit is Docket Alarm’s email alert tool. You can receive timely updates from the CAFC by creating your own “disposition sheet.” Simply set up a daily email alert to track Docket Alarm’s Federal Circuit database, and have new opinions and orders sent right to your inbox. New opinions are attached as PDFs to each email alert, eliminating the need to visit the CAFC’s website, or login into and search PACER. Additionally, Docket Alarm’s email alerts offer summaries of each new opinion and order, allowing you to quickly determine the update’s relevance to your needs. These emails are easily forwarded and shared with partners and colleagues. Sign up for Docket Alarmtoday to create your own daily dispositions sheet and stay on top of the latest news coming out of the Federal Circuit.